Water is so problematic in a lot of cities. Plastic trash and litter in rivers, lakes, streams, and oceans altogether is still one of the hardest problems to solve. Some cities try very hard to minimize it, and some just can’t be bothered, leading to more troubles in the aquatic life. Netherlands has made a difference with their trash-eating aquatic drones to clean pollution on harbors. And recently, one of its cities, Rotterdam, has set an example for all cities with water anywhere in the world. The city has made an innovative method of minimizing plastic waste. This park debuted on July 4 in Rijnhaven. It’s an idyllic harbor on the south bank of Nieuwe Maas. It’s a part of Rhine River that flows through Rotterdam and into the North Sea. Around the vicinity of the park are a floating forest and event pavilion, as well as the city’s iconic Erasmus Bridge. The project is done by an environmental organization called the Recycled Island Foundation. They’ve collected plastic from the drones and they bring those plastic back to Rotterdam’s harbor. Not to dump them back, of course, but to transform them into a floating green space called Recycled Park. Recycled Park is a 140 sqm wide space with chain of hexagonal platforms made from recycled plastic. To make it stay put, they’ve anchored it to the harbor floor. The platforms have different heights and each is rife with different types of plants and vegetations. The park is basically a floating garden that doesn’t only attract people, but also critters like bees and aquatic birds. Those animals can rest, nest, or find shelter at the park before they continue their journey in the deep waters or anywhere else. In short, it’s a buoyant refuge for people and all kinds of animals, including the ones that live in the waters. When you look at the bottom of the platform, you’ll find that the undersides are designed to nourish aquatic life. Recycled Island Foundation stated that those undersides have a rough finishing so that plants can flourish easily and the fish can have a place to lay their eggs. The purpose is to upgrade the harbor’s ecosystem. You can still sit there, of course, since two platforms have seating elements. Those two really looks like oversized hot tubs with no water. You can have conversations, relax out on the water, or have a drink on platforms connected to the shoreline. It’s just that you won’t wear swimsuit and dip in hot water, and whirlpools. You feel like floating, but the bright side is that you can see boats pass by, feel the wind, hear the waves, and all around you is lush greenery. But if you’re a more city type of person, you can still see high rise residential buildings and amenities. After all, the park is within a revitalized industrial area, and it’s around waterfront Rotterdam real estate. It means that you’ll get easy access to public transit and water taxi. Trapping and collecting trashes from Nieuwe Maas took about a year-and-a-half. Whilst doing that, the foundation also demonstrated that the open waters has got valuable materials which are suitable for recycling. They didn’t state the exact number or quantity of the trash they’ve retrieved to create the park, though. Founder of the foundation, Ramon Knoester who also happens to be an architect, said that giving attention to the scourge of “plastic soup” (his way of saying water filled with trash) is more important than the park itself. Knoester also implied that he would like to do Recycled Park in other port cities such as London and Antwerp which are similar to Rotterdam. But even if he didn’t do it, having a park made from recycled plastic which encourages biodiversity would still be cool and it leaves a big impact. 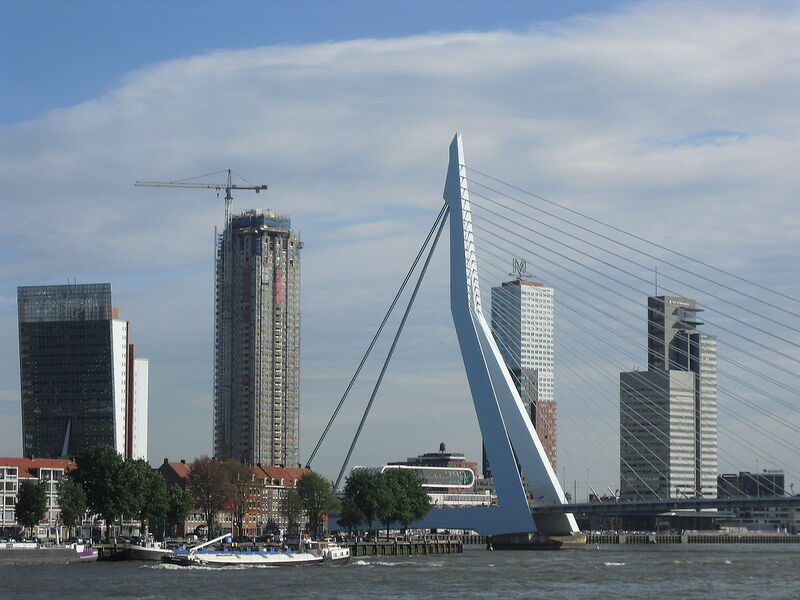 Rotterdam is known for its unconventional and innovative characteristics. History has taught this city to be driven to create something new and love playing with new ideas. No wonder that this city is a magnet to entrepreneurs, engineers, urban planners, architects, scientists, and many more type of professionals. To think of it, this city has got floating dairy farm, for heaven’s sake. In 2016, Fast Company interviewed Daan Roosegaarde. He’s Rotterdam’s most well-known sustainable designer and he has gained international attention for his innovation such as glow-in-the-dark bike paths that you’ve probably seen on internet as well as smog vacuum cleaner. Have you ever found similar project or initiatives around your city? Do you think this kind of park will go viral and everybody will try to make the same thing, which is good for the environment? Tell us your thoughts about this article in the comments below and be sure to read this article for a related reading.